Ellie Midwood is an award-winning, best-selling historical fiction writer. She's a health obsessed yoga enthusiast, a neat freak, an adventurer, Nazi Germany history expert, polyglot, philosopher, a proud Jew and a doggie mama. 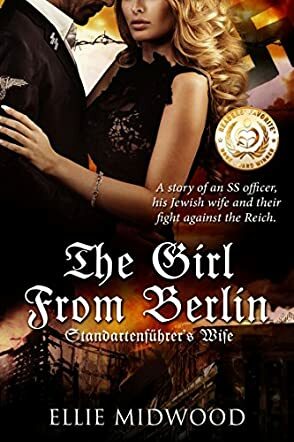 The Girl from Berlin: Standartenführer's Wife is an historical novel written by Ellie Midwood. When she was growing up, Annalise Meissner was not interested in going to school with the other children her age. She’d much rather practice her pirouettes and dance in the square, but somehow, Gryselda, the family’s housekeeper, knew her preferences and made sure she was safely back in school. Annalise was really much more comfortable with adults than children her own age, and she loved being with the grownups in her life. Her perfect world had some strange aspects to it, however, such as the talk her father had with her and her brother, Norbert, when she was nine years old. The Meissners were not really the Aryans she had always believed them to be, but rather they were originally from Poland and were Ashkenazi Jews. Her father’s grandparents had seen troubles coming and had changed the family’s name and converted to Protestantism to protect the family and their assets. Still, as Annalise was growing up in the comfort of the family’s upper middle class lifestyle, the treatment of the Jews in the increasingly intolerant conditions in Germany during the 1930s was troubling, especially considering her beloved family doctor, his son who would become her dance partner, and the other Jewish people she cared so much about were in deadly peril while her life continued unchanged. Ellie Midwood’s historical novel, The Girl from Berlin: Standartenführer's Wife, is a fast-paced and utterly enthralling novel that chronicles the years leading up to World War II through the eyes of a young ballerina, Annalise Meissner. This novel is meticulously researched, and Annalise’s story is so compelling that I became totally engrossed in her life and experiences. Midwood is a master at blending fact and fiction in such a way that I was often tempted to revisit my history books to see which characters were historical personages and which were not. Her writing is seamless and inspired, and I soon forgot that an author was actually the creative force behind Annalise’s words. I was quite pleased to discover that Midwood plans a sequel to this story, Gruppenfuhrer’s Mistress. The Girl from Berlin: Standartenführer's Wife is highly recommended. Although this book could have benefited from a good edit, the characters were well-developed and the story was intriguing. Ms. Milwood really pulls you into the Nazi era, and the whole time I was reading this, I felt a myriad of emotions. Annalise is a very 3-dimensional heroine and the ending is left open for the sequel. Well worth a read, especially to those interested in World War II! ‘The Girl From Berlin: Standartenführer’s Wife’ pulled me in and held me captive from the very first page. Written from the point of view of the heroine, Annalise, the story follows her sufferings and triumphs during the rise to power of the Third Reich. At just seventeen, Annalise’s extraordinary talent as a ballet dancer catapults her into the shamelessly arrogant, often brutal society of high-ranking Nazi officials in Berlin. With poignant clarity and directness, her written voice depicts the horror of Hitler’s purge, of enduring the loss of her friends, neighbors and countrymen whose only crime is that of being Jewish. Yet Annalise learns that not all Nazi officials share the heartless designs of their leadership, for one man, Heinrich, proves himself through kindness and compassion to be worthy of not only her admiration but also her love. She can even share with him the dark, hidden truth of her heritage, which, if revealed, would condemn not only her but her entire family. The two wed amid the threat of war and the continuing atrocities perpetrated upon her people. Eventually Annalise’s innate connection with her heritage, coupled with the vicious murders of her brother and countless others, motivates her to risk her all against a regime whose barbarity knows no bounds. The plot is enthralling, the suspense spine-tingling, building with such realism that I felt as if I were right there in the heart of the action. Whenever I was forced to break from reading, I couldn’t wait to get back to the story, to see what would happen next to the characters who come to life in this stirring tale of intrigue, betrayal and love. Caught up in the precarious world of counterintelligence, Annalise forms an alliance with the chief of the Austrian Gestapo, a dangerous man whose help she desperately wants, to whose beguiling appeal she ultimately succumbs. The emotional strain of deceiving her caring husband, of making impossible choices to aid herself and her people, takes a toll on the once innocent Annalise, yet despite the danger of exposure and certain death, her strong will and intense hatred for the powers that be carry her forward to a nail-biting conclusion that left me wishing for more. And so I say, Bravo! Ms. Midwood, for taking me on a remarkable journey that I can’t wait to continue.